In response to architect Ken Adam’s latest comments of 28 February, the mayor has made disturbing comments about the proposal for the Coles Woolstore site. The Fremantle Society commissioned two prominent architects to analyse the Gerard O’Brien Silverleaf proposals for the Coles Woolstores site, a huge piece of land opposite the heritage listed railway station and alongside the heritage listed Marilyn New woolstores (though the mayor keeps saying it’s in the ‘east end’ ‘away from the heritage’ of the town). 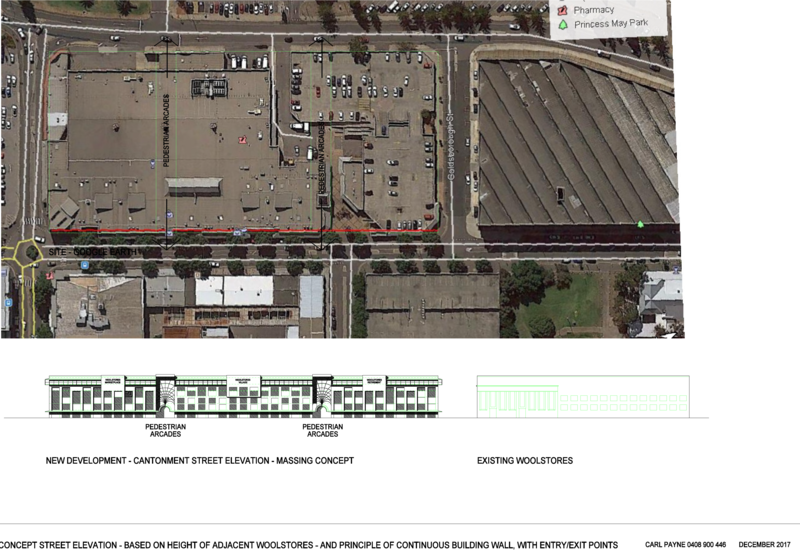 Ken Adam wrote a detailed report and spoke at the council planning committee, saying that whatever went on the site should fit within a plane running from Marilyn New’s wool store (21 metres on the left of the image above) to the 4 storey O’Brien new building on the corner of Queen and Cantonment Streets (approx 21 metres). Architect Carl Payne sent us a sketch of his analysis, which agrees with this and is shown at the bottom of the image above – a very substantial building which would fit the desired square meterage required without needing the proposed towers, and in keeping with the bulk and scale of the wool store which stood there originally. That view was backed up by the other expert we commissioned – Malcolm Mackay – who sits on seven metropolitan design review committees. My comments remain relevant for three reasons. First, Amendment 49 allows the Council to approve a design that may be be “exceptional” or “distinctive” or even “excellent”, but does not oblige it, especially if it is inappropriate or offensive in some way, for example, as in the present case, in terms of its scale. Second, in no way can the design be judged to be “excellent” if the design is not complete, as in this case, where an important and distinctive part of it (the northern section of high rise) is not even included in the application. I have no doubt that, because of this, any approval based on a judgement of “excellence” or equivalent would be thrown out by the Supreme Court. Thirdly, even if the design were complete, there is no guarantee that it would ever be built completely as approved, a fact acknowledged by the officers and the Mayor, so no guarantee can ever be given of its “excellence” or equivalent.I suggest the Council is on dangerous ground. I can’t agree however as , I am sure you aware, the Fremantle Council is not the approving authority for any of the Amendment 49 sites but this will be done by the JDAPs. They rightly have rule-based approach to decisions and those rules for approval are clearly laid out in Amendment 49. These comments are deeply disturbing, because, once again, the mayor is washing his hands of the council’s role in these sort of major developments. Again he is blaming the JDAP, when in fact it was his council which pushed through the controversial scheme amendment 49 despite the majority of the community being opposed, and it is his council which will write the report for JDAP and his council which has the opportunity to assess it at the planning committee stage and provide advice to JDAP. As the Fremantle Society showed last week with its progressive and sustainable vision in its full page ad in the Fremantle Herald, the current council has failed to rejuvenate Fremantle with quality new developments. It must begin doing a much better job. Ken Adam has made a number of important points above. There is no doubt that the mayor and council are keen to push through as much development as fast as possible. There is every indication that the council will approve whatever Gerard O’Brien comes up with at the next iteration of the Coles Woolstores saga. Then O’Brien will have an approval for the biggest site in town along with the 6,000 sq m Police Complex site going to the planning committee next week with a recommendation for approval, the hastily approved Mannings Buildings site of 28 shops, and the unfinished Atwell Acade debacle. On top of that, the other projects already approved and council’s own “Cultural Centre” around King’s Square will soak up more than the current demand from developers and the damage to the town’s architecture will have been done. Then the people of Fremantle will ask for a debate on the quality of architecture. Too late my dears! There will be a few book launches in the next few weeks. You are invited to attend the launch of the book Henderson & Coy, Royal Engineers & the Convict Establishment Fremantle, WA, 1850-1872, published in 2017 by Dr Rob Campbell. Date and time: Tuesday 6th March 2018, 6pm. Venue: Cullity Gallery, UWA School of Design, The University of Western Australia – Nedlands Campus, Clifton Street entry. New book: Henderson & Coy, by Rob Campbell, 2017. Then in 2017, Rob turned these interesting stories in to a more accessible book. In his author’s preface Rob wrote: ‘There is the interaction of people rubbing along together while not always enjoying it; there are people who do not enjoy being ruled and over-ruled by remote control from England; there are those who take advantage of the tyranny of distance and a communication time-lapse of three months each way; and those who just get on with the job in difficult circumstances’. You are invited to attend the launch of the book Yesterday’s Heroes, published in 2017 by Roundhouse Press (Fremantle Society member Allan Watson). Chris Carmody relives the golden era of Fremantle’s footballers and wharfies. You are invited to a book launch of the book Swan River Postcards, published in 2108 by Aussiana Books. John Dowson takes you on a journey down the river using original postcards. Secret location and date to be announced soon. The officer report on the Gerard O’Brien Police Complex development in Henderson Street, the site the council should have bought, goes to council planning committee next Wednesday with a recommendation for approval. The Fremantle Society made a submission after consultation with architects such as Gerard McCann, officers from the National Trust, and the Heritage Council. The Fremantle Society will study the officer report which wll go to JDAP after going through council, and it is available now online. In the report officers argue that the 6th floor of the hotel should be deleted, but are allowing a 5th, despite the fact it is NOT set back as required by the rules, and despite the fact it is NOT consistent with the predominant existing scale, which rises after you go west across Henderson Street into the town, as the officer report admits. There is a shortfall of 282 car bays, but these days council not only does not ask for cash in lieu for parking, but sells its own car parks. This important community event is sponsored by the Fremantle Society and is your chance to hear from both mayoral candidates, incumbent Dr Brad Pettitt, and challenger Ra Stewart. To be sustainable Fremantle Council needs to grow its population and its land area, not annoy people so much they don’t want to be part of us. There is currently another push from North Fremantle residents to secede from Fremantle. A previous effort to secede just a small area near Mosman Park failed, but now there is a much more ambitious plan, which seeks to take all of North Fremantle except Fremantle Ports land into an amalgamation with Mosman Park. The mayor of Mosman Park Ron Norris had a meeting with seven of the group a couple of weeks ago. Mosman Park has accepted the idea in principle, and the Fremantle Society has been told by the mayor and the secessionist side that the concern from locals revolves around dissatisfaction with Fremantle Council in general and specific concerns about foreshore and insurance issues. East Fremantle made it very clear they did not want a voluntary amalgamation with Fremantle when they had the chance. Hamilton Hill residents next door to Fremantle booed the amalgamation idea so much at a public meeting last year, Fremantle councillors Coggin and Hume slunk out of the hall. When the amalgamation of Fremantle and Melville was mooted by the Liberal government, Melville Council told the Fremantle Society they thought the Fremantle finances were so suspect, they would not be interested. Cockburn has refused to give an inch of its northern suburbs, even though the South Fremantle power station is not in Fremantle but Cockburn. The North Fremantle group have not made the secession an election issue, because they want nothing to do with Fremantle Council. Their chances of success may be slim, but the totality of rejection of Fremantle Council by so many people, should be a wakeup call to the council. This is especially true during the current mayoral election where Dr Pettitt is seeking a third term. This issue should motivate the mayor and council to do a better job, to cut the spin and fake news, and to represent the whole community – not just small segments of it.